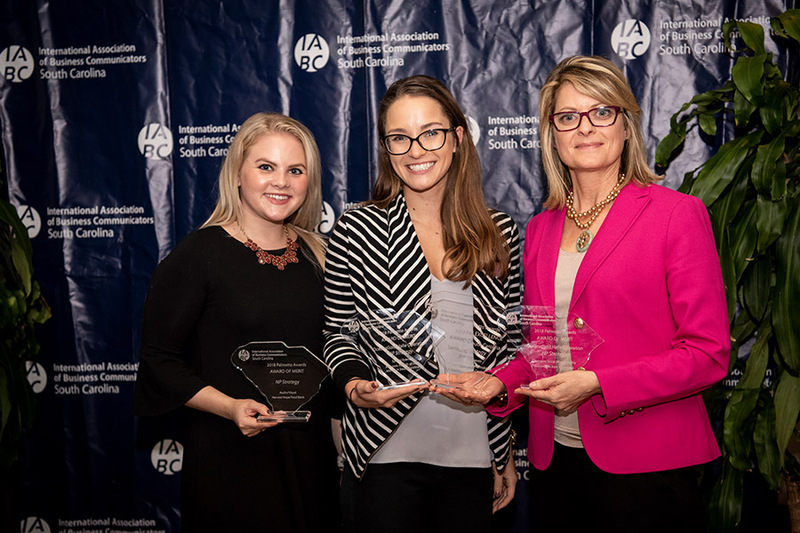 SOUTH CAROLINA – NP Strategy (NPS+), a strategic communications firm in North and South Carolina, won four awards for exceptional work during the annual International Association of Business Communicators’ (IABC) 2018 Palmetto Awards on Thursday, November 8. NPS+ received the awards for the team’s work with Harvest Hope Food Bank, OceanaGold Haile Operation and Samsung South Carolina. Palmetto Awards are judged by communications professionals from cities across the U.S. and Canada. NPS+ won an Award of Excellence in Special Events for Samsung’s 2018 Grand Opening event, a two-day event welcoming both community leaders and employees’ families. NPS+ received an Award of Merit in the Audio/Visual category for its Harvest Hope Food Bank Kids Café video, which promotes the food bank’s program to end child food insecurity and appeals to current and potential donors. NPS+ received two Awards of Merit for its work with OceanaGold Haile Operation: in the Special Events category for Haile’s 2017 Grand Opening event and in the Corporate Social Responsibility category for the Carolina heelsplitter mussel preservation effort. This year’s four awards bring NP Strategy’s award total to seven Palmetto Awards in three years. Additionally, NPS+ client TSO3, Inc. will receive the award for Product Innovation as a winner of the South Carolina Chamber’s 2018 SC Branded Awards.